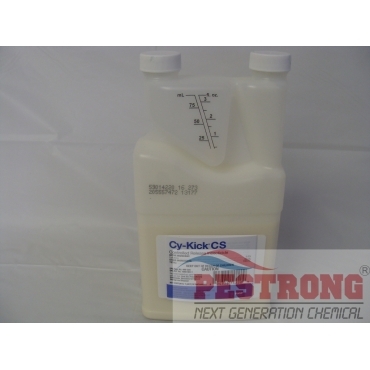 Where to Buy Cy-Kick CS, Cy-Kick CS Insecticide - Pt - 120 Oz - $39.25 for Sale with Fast Free Shipping! Cy-Kick CS Insecticide - Pt - 120 Oz is the multi-use insecticide designed for professionals like yourself who want a product that works just as smart as you do. Caravan G Granular Insecticide Fungicide -.. It dishes out 90 days of full-throttle, broad-spectrum killing power, controlling insects inside and outside, on the toughest areas and surfaces. The difference is SmartCap microencapsulation technology that protects cyfluthrin to create a long residual and a mobile lethal dose of this broad-spectrum active ingredient that insects easily pick up. Cy-Kick CS has the high-powered performance and flexibility you need, at a competitive price. And it’s much less likely to cause skin irritation than some other products. † Do not use in aircraft cabins. Good insecticide. I will re-order soon. After a little research, I found out that Terminex uses CYFLUTHRIN. I paid Terminex for 4 years of scheduled treatment using this product. I also found out that they may "water" down their product a little to much. Regardless, I was paying a little over $400/yr with big T. If used as the label recommends (1oz per gallon of water), I will get 2 years of treatments out of this bottle. So, $35 vs $400... I go with Pestrong. This insecticide really works! I sprayed the perimeter of our home, doorways, windows, and any voids. Found dead insects at different point of entrees. Price was great. Delivery was fast. Great product and have used for long time with great success. Saving money doing myself! !